Yesterday a friend asked me about my thoughts on the new the new MacBook Pro with Retina display. My thoughts about some issues might be useful for other photographers out there that are considering buying one. For the record I have not seen the MacBook Pro with Retina display in real life but I hope to get out this weekend to check one out. Here's the important thing to understand about the MacBook Pro Retina, there is no way to see the full retina resolution of 2880 x 1800 so there is no way to see 1:1 or actual pixels, unless maybe you use Aperture which is the only editing program that is written to work with it so far. This is a huge problem for photographers until Adobe updates Photoshop and Lightroom. Even though the Apple site tells you otherwise as I understand the MacBook Pro Retina ships with the display set to 1440x900 (which is what my 13 inch MBA runs) and not 2880x1800. What you get is the effective desktop resolution of the standard 15.4 MacBook Pro with a 1440 x 900 panel, but with four pixels behind every single pixel on the screen. This configuration should offer amazing detail but you don't actually get any more desktop space. There is no way to actually see this actual 2880 x 1800 unless you run Windows 8 (see the anandtech link below). The MBP Retina is really running insane resolution then scaling down to display 4 pixels for every 1 pixel on a normal display. To help you understand the issue think of this like a the resolution of a print, lets say the normal MPB 15.4 display looks like a 72 ppi 8 x 12 print for example, the MBPR display is similar to a the same 8x 12 inch size but at at 220 ppi. This is based on what I have read I can't actually say what it really looks like since I have not seen on in person. There's one other thing that shouldn't be overlooked, images shown on a normal MBP will look exactly half the size on a MBPR since the display is showing them scaled down. 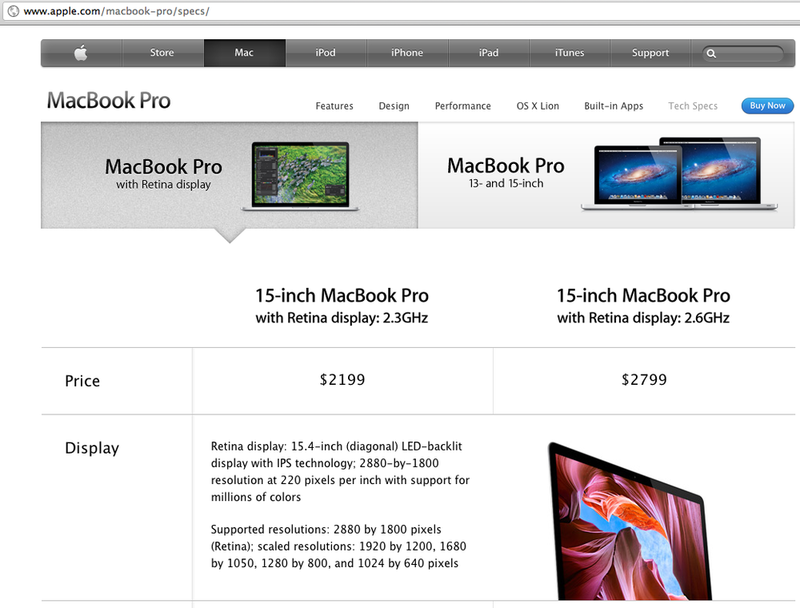 You would have to resize an image to twice the size for a MBPR to show at the same size as a normal MBP. I am keeping my 17 inch MBP and 13 MBA for awhile, although a 13 MBA with USB 3 looks interesting! If you've have anything interesting to share can know something that isn't mentioned here, be sure to share 'em in the comments below.